A little green brochure caught my eye. It was publicizing a conference for homeschoolers. My wife, Joanie, and I are committed homeschoolers. The conference was also about churches, and I am the pastor of a church. Let me begin by saying that this article is not intended to be one that says that everyone should do things in the same way that I do! I believe in parent-directed education. 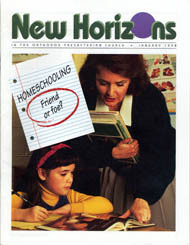 Homeschooling is one manifestation of such education. One of the beauties of homeschooling is that each parent can decide how best to achieve a godly and academically excellent education for his or her children. Oftentimes fault lines in the earth's crust are not noticeable at the surface, and shifts in them (producing earthquakes) are not predictable. Consider, for instance, an earthquake that hit southern California in 1995. The epicenter was in a northern suburb of Los Angeles, where people thought they were relatively safe, some distance from well-known fault lines like the San Andreas Fault. What a surprise it was when the earthquake hit! "Blessed is the man who does not walk in the counsel of the wicked or stand in the way of sinners or sit in the seat of mockers. But his delight is in the law of the Lord, and on his law he meditates day and night. He is like a tree planted by streams of water, which yields its fruit in season and whose leaf does not wither. Whatever he does prospers. Not so the wicked! They are like chaff that the wind blows away. Therefore the wicked will not stand in the judgment, nor sinners in the assembly of the righteous. For the Lord watches over the way of the righteous, but the way of the wicked will perish" (Ps. 1).